Determined to break the stereotype of biker gangs as bad guys, this YA story plops a nice girl smack in the middle of them to find love, trust, family—and herself. Emily is secure in the privileged life she’s known with her mother and stepfather. Her biological father, from whom her mother fled when Emily was a baby, leads a motorcycle “club” called the Reign of Terror. Emily only recently learned about him, and has very limited, very controlled contact with him, which suits her fine. Until the summer she’s thrust into his world when her grandmother dies. That event leads us into a Romeo and Juliet story of forbidden love amid two hostile families tortured by secrets. So many layers of secrets! Because of them, the books snaps, crackles, and pops with tension arising from sexual attraction; an impossible situation with a win-win scenario hard to imagine, and its origin revealed through widely spaced clues and explanations; conflicting truths and twisted integrities that make sense in one person’s context but not the other’s; knowing what’s in the characters’ heads versus what comes out of their mouths, and seeing dangerous misunderstandings looming like an oncoming train. The narrative point of view alternates between Emily and Oz, a young tough with a heart of gold whose goal in life is to be inducted into the Reign of Terror. Boy and girl begin as enemies but eventually succumb to lust then love for each other. They learn compromise the hard way as they struggle to help their alienated families overcome their differences. Ultimately the story becomes a demonstration of how lies breed lies, and why they are counterproductive as well as immoral. Even though the lies are told to protect people’s loved ones, they end up hurting everyone in many ways across generations. Emily and Oz, tellers and receivers of lies, often seem younger than their 17 and 18 years. At the same time, they show precocious wisdom. Their voices, however, are credible for their ages and era (contemporary). Indeed, the story opens with Emily’s vivid first-person voice and dilemma that pull the reader right in. 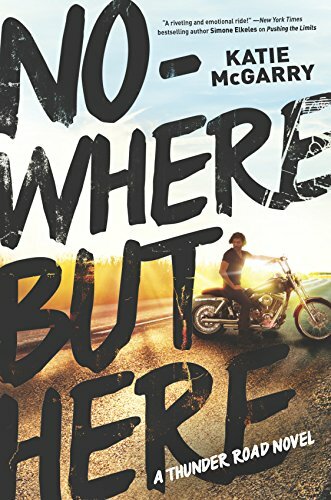 Nowhere but Here is first volume in the Thunder Road series, which will feature different characters from the motorcycle club. It’s off to an engine-revving start that promises to thoughtfully entertain both young adults and older readers.